Michel Lambert was admired as a singer, lutenist and teacher in 17th-century Paris and, while remembered today as Lully’s father-in-law, he was also a composer of merit. An early set of nine settings from the Lamentations of Jeremiah, Lambert’s Leçons de Ténèbres have come down to us in manuscript, simply scored for solo voice and continuo. 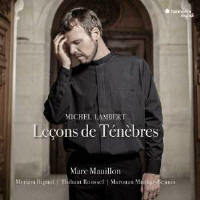 Sensitively interpreted here by the baritone Marc Mauillon, they are both contemplative and – in this, the first complete recording – cumulative in their intensity. Imagine yourself, then, in the court chapel of the young Louis XIV, its windows darkened by drapes, the candles gradually extinguished over the three days of Tenebrae services preceding the most important event in the Catholic liturgy, when the chapel would again be flooded with light and a sense of renewal. Mauillon and his colleagues have taken as their assumption that Lambert, a court musician in his own right, might well have performed this music himself. Mauillon, who is usually to be heard in earlier music, is especially well placed, vocally, to realise the quasi-improvisational, spiritual qualities of Lambert’s sublimely conceived music. In Myriam Rignol, Thibaut Roussel and Marouan Mankar-Bennis he has chosen remarkable collaborators, each prepared to immerse themselves in the relationship between text and music, then together plan and pace the realisation of each leçon in order to reflect Lambert’s original intentions. Their accompaniments are subtle, intricate and incredibly varied – so much so that listeners to this set will feel compelled to return to it again to admire their artistry. The unwavering, honest quality of Mauillon’s reedy voice – so suited to earlier music – works perfectly in this context, creating the sense of a cantus firmus on which the instrumentalists elaborate. The beautifully executed instrumental solos by Lambert’s contemporaries Ennemond Gaultier and Nicolas Hotman, carefully positioned at the beginning and end of several of the leçons, offer appropriate moments of respite. Might this release have laid down a new benchmark in the revival of 17th-century performing practices? I think so.